This page will provide you with information about ptosis surgery. For further details, please speak to your consultant. The levator muscle (which lifts your upper eyelid) can stretch and weaken. 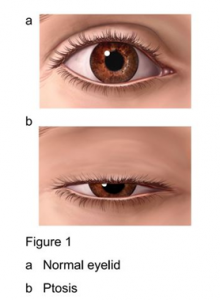 When this happens, it can cause your eyelid to droop down over your eye and could start to interfere with your vision (known as ptosis) (see Figure 1). This can be as a result of aging, long-term contact lens wear, or after other eye operations. If your eyelid is drooping over your eye and affecting your vision, ptosis surgery can help improve this. Ptosis surgery can also be used for cosmetic reasons and can make you look younger. For example, if one of your eyelids has begun to sag or there is a difference in the height of your eyelids this can be corrected with ptosis surgery. If you want to effectively tighten the levator muscle, ptosis surgery is the only effective procedure. However, you should consider the options carefully and have realistic expectations about the results. A non-surgical alternative includes ptosis props, which can be fitted to a pair of glasses to lift your eyelid up. However, these props can be awkward to wear and do not correct the problem. The operation is usually performed under a local anaesthetic, which will numb the area being operated on. A ptosis surgery usually takes between 45 to 90 minutes, depending on whether the operation involves one or both upper eyelids. Your surgeon will usually make an incision on the natural skin crease of your eyelid. They will place stitches in the levator muscle to strengthen its attachment to your eyelid, as well as adjust the eyelid to a more preferable height. You should be able to go home after a few hours but your eye will likely be padded shut for 24 hours following the procedure to reduce swelling. If you have had the procedure on both eyes, you may be given icepacks to reduce swelling. Do not get your eyelid wet, perform any strenuous exercise or bend down until the stitches are removed. Do not wear eye make-up for a few weeks following the surgery, and try to keep your face out of the sun. replace advice that your relevant health professional would give you.